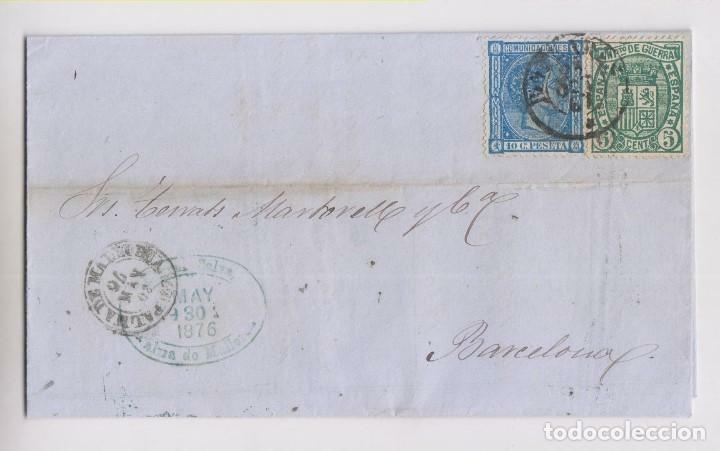 CARTA DE SAN SEBASTIAN A SEVILLA, FRANQUEADA CON LOS SELLOS Nº 175 Y 183. CARTA DE PALMA DE MALLORCA A SEVILLA, FRANQUEADA CON EL SELLOS Nº 154 Y 164. ESPAÑA. (CAT. 204).1880. CARTA DE CÁDIZ A SEVILLA. 25 CTS. MAT. DOBLE ROMBO CON ESTRELLA. MAGNÍFICA. ESPAÑA. (CAT. 204). 1879. CARTA DE MADRID A SEVILLA. 25 CTS. MAT. TRÉBOL MADRID. LLEGADA. BONITA. Hora oficial TC: 02:07:59 TR: 104 ms.